El Greco, 1541-1614, one of Italy's famous artists in art history trained in the Venetian School, painted one of his famous paintings "Burial of Count Orgaz", in 1586. He was the last important Mannerist painter. The Mannerists generally reacted against the formal, classical, compositions of the High Renaissance. They purposely rendered, rough, crisp, linear lines, and took the freedom to explore and paint their own inner visions. The "Burial of Count Orgaz", actually took place in 1333. El Greco has recounted the burial scene in and contemporized it placing current nobility and clergy as attendants. Mysticism was intense in Spain at the time of this painting, which possibly had influence directly on his composition. The upper half of the painting is painted in a mystical heavenly environment with wild free flowing forms figures and shapes. The art is so loose and expressive that the iconography and figures are almost lost in the frenzy of sharply highlighted abstracted forms. The bottom half is more decorative, detailed, ordered and clear. The subject for the "Burial" was that good works were a part of salvation and the saints in the upper half of the painting are intercessors between man and God. Saints Stephen and Augustine suddenly appear at the funeral and lower Count Orgaz into his grave. Directly above their heads an angel carries the soul of the Count to Heaven. Greco took into account the space of the chapel where "Burial of Count Orgaz", was to be seen. It is small, only eighteen feet deep. He purposely elevated the painting six feet off the floor to cause the viewer to look sharply upward to see the top of the painting. This effect and his foreshortening gave the illusion of boundless space above the heads of the attendants, looking like the real Heaven. El Greco's portrait of "Fray Felix Hortensio Paravicino", 1605, has the same high contrast of whites, against a dark background, that Gruenwald painted in his Crucifixion of 1510, giving the composition, a super, high, intense reality. He painted "Frey Felix" in the loose, un-linear, quick brushstroke style of the Mannerists. Other famous artists of the Renaissance art period are Correggio and Giovanni Bellini. 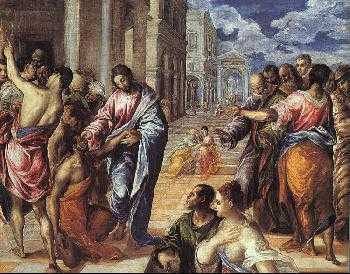 To view the entire gallery of El Greco paintings, click here.